A Society Room Wedding Photographer often feels like he has stepped onto a movie set for a 1920s tale like The Great Gatsby. The gorgeous Society Ballroom is a sight to behold and is a treat for any Society Room Wedding Photographer. The grand ballroom contains soaring marble columns that reach up to a beautiful muraled ceiling. The ballroom also has a dramatic 3,000 square foot indoor balcony with a sweeping staircase that flows down to the ground floor of the room. The unforgettable space is filled with marble, limestone, brass, and bronze accents that give the venue a lavish air. The venue prides itself on being a place “Where Elegance Meets Excellence” and this is obvious to any who attend a Society Room event. From the grandeur of the ballroom to the impeccable service offered by the staff, the Society Room gives couples and their guests the feeling that they have time traveled to the extravagant parties of the Jazz Age. This image captures that 1920s feeling in a unique way. The picture focuses on the profile of the groom. The coloring of the picture gives it a metallic quality, highlighting the groom’s lone silhouette. 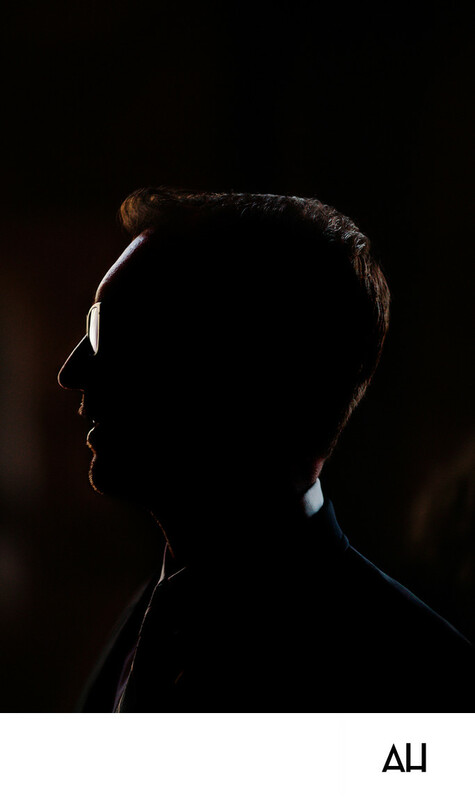 In the dark glow of the space around him, the groom wears sunglasses, and an off camera light glazes over them adding to the shine of the image. On his face is an expression of wonder as he takes in the sights, sounds, and feelings of the day. It has been an evening that will go down in history for him and his new wife.